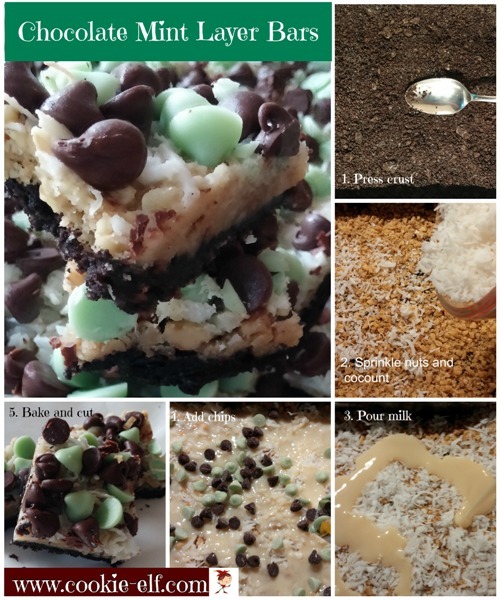 Chocolate Mint Layer Bars bring together the luscious combination of chocolate and mint, popular because many cookie aficionados find the pairing both enticing and refreshing. These Christmas bar cookies are especially attractive at the holidays because of their visual appeal, reflecting the green of the Christmas season. Preheat oven to 350º F (325º F for a glass dish). Place the chocolate sandwich cookies in a food processor. Using a steel blade, pulse the cookies until they are finely ground. Or place the cookies in a plastic bag and use a rolling pin to crush them. Spray the sides of a 13 x 9 baking pan with baking spray. (This will prevent bars from sticking to the sides of the pan.) Cut margarine into the pan. Set the pan in the heated oven to melt. Remove the pan from the oven. Sprinkle the cookie crumbs over melted margarine. With a spoon, combine margarine and crumbs until they are well mixed. Use the back of the spoon to press the mixture evenly into the bottom of the pan. Sprinkle chopped nuts and coconut evenly over crust. Pour sweetened condensed milk evenly over bars. Sprinkle with morsels. Bake bars 25-30 minutes until coconut is lightly browned. Remove the pan from the oven. Allow bars to cool completely on a wire rack. Chill if desired. Cut into bars. Dark chocolate and mint morsels are often only available seasonally in stores. Buy an extra bag or two to keep in the freezer to use in Chocolate Mint Layer Bars and other recipes during the year. 7 Layer Bar Cookies: no mixing! Fudge Mint Brownies recipe: bar cookie, brownies, layer cookie - YES!